After winning the World Championship for the third time in a row, Jacare and Fabio decided to unify our teaching method throughout the team. On the last week of November Fabio Gurgel came up to The Alliance HQ in Atlanta, GA. 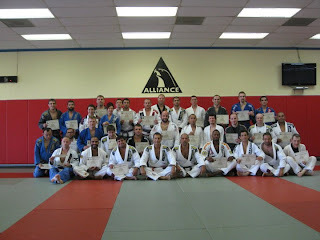 Together with his Master Jacare they led all the Alliance Instructors through the first phase of the Instructors course. The Course was held from October 26th-28th from 9-12:30pm. We had a number of our own students as well as Instructors from our affiliate schools represented. Fabio and Jacare led a crash course in their teaching methodology and built a new training system based around Self Defense and Jiu-Jitsu Fundamentals. The purpose of this system is to ensure that new students have the tools to able to effectively defend themselves against a bigger more aggressive opponent. There is nothing revolutionary about this approach, quite the opposite actually. With the popularity of Sport Jiu-Jitsu, Instructors have begun neglecting the some of the key principles that make Brazilian Jiu-Jitsu so affective. This 25 class program will provide the students with a solid foundation from which the more advanced techniques can be built. The course was well received and after 3 days of role playing and training all 32 participants received their certification. Next post Kid Peligro Jiu-Jitsu News . . . Worlds No Gi Quick Results. Previous post From Alan Belcher to Urijah Faber students, Rio is popular training destination.